My personal sanctuary is my study. That’s where I go to write, relax, watch TV, or just read. When I’m there, so is Toby. Yesterday afternoon, as I started to let Toby out, I discovered we had a visitor, a gray tree frog. 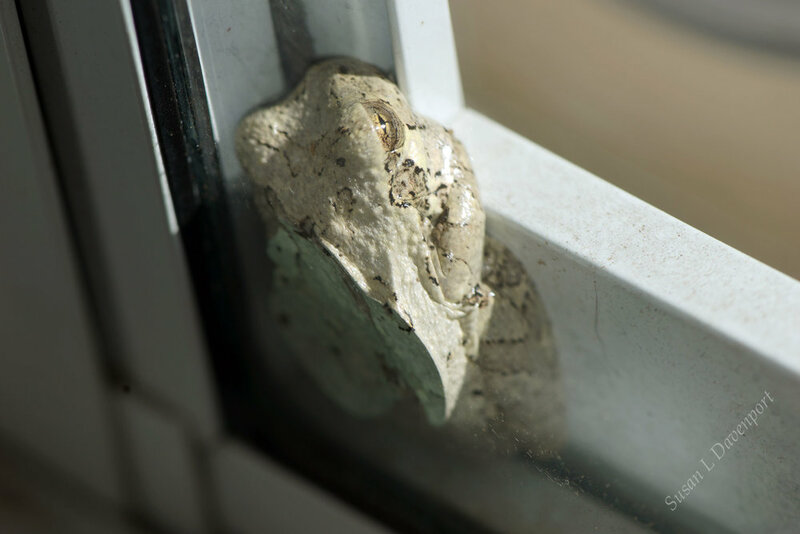 The gray tree frog is nocturnal, so when daylight comes around, he finds himself a place to be safe and sleep the day away. This little fellow must have spent the evening before on my door, catching bugs drawn to the light, then wedged himself into the door frame at daylight. He looked uncomfortable. By the time I found him it was late afternoon and the sun was beating down on him. I thought he was going to melt. He was white as if he were sick. I had never seen a tree frog that color before. It turns out that gray tree frogs can change their color like a chameleon, just much slower. Wedged into the white door frame, he changed his color, so he blended in. The Gray Treefrogs have evolved over time to have 48 chromosomes and are called tetraploid gray treefrogs in scientific circles. The Cope’s Gray Treefrogs or diploid gray treefrogs have retained their 24 chromosomes. The two species can mate successfully, but the hybridization results in a high mortality rate of larvae, and a low fertility rate in the frogs that survive to adulthood. The gray treefrog can change their color from gray to green depending on their surroundings. They can be almost white or almost black. The mottling in the color varies. I bet if I see this little frog again I can identify him because of his unique mottling pattern. I took a couple of pictures from the inside, but I was really worried about him. He looked so hot, and that bright sun was shining right into his eye. He is a nocturnal creature; I was afraid the sun would blind him. So, I gently opened the door and went out to see if I could help him in some way. He looked even worse from the outside. I thought about getting a stick and seeing if I could coax him out into my hand so I could put him into the tree. After all, he is an arboreal tree frog, he should be more comfortable in a tree than wedged into my storm door, but he looked so melted I was afraid I would poke a hole in him. That would be bad. Both the gray treefrog and Cope’s gray treefrog have bright yellow coloring on the inside of their hind legs. It’s normally only seen when they are jumping, so I didn’t get a picture of his yellow legs because he refused to jump for me. He would have probably been too fast for me anyway. I was afraid of poking him, but I couldn’t just leave him in the hot sun, so I pulled a couple of leaves off the tree and made him some shade. Of course, once I did a little research I learned that gray treefrogs are much more tolerant of the sun than green tree frogs are. He might have been fine without the leaves, but he sure seemed to be thankful for a little shade. I wanted a picture of those yellow legs so badly. I kept my camera out until late, it was almost nine pm, and well after dark. I normally close the wooden door at dark, but that night I left it open, waiting for the frog to move. Now and then I would check on him. Once when I let Toby out, the frog moved as if he were going to jump, but then he hunkered down again. By the time it got dark, he had been next to the green leaves long enough he had changed color. He wasn’t quite green, but he was a much darker gray, closer to the tone of the green leaves than the white door frame. I was afraid the light coming from inside the house was confusing the frog and keeping him from hunting. A bug walked right up to his leg and the frog didn’t move – he probably knew I was watching. So, I finally closed the wooden door for a few minutes. When I opened it again, he was gone, and the leaves were on the ground. I sure enjoyed getting to take pictures of that little frog. I’ve searched all over for him in the hope that I could get some better pictures, and maybe even a glimpse of those yellow legs, but I can’t find him anywhere. He’s probably back up in the trees telling all his buddies about the crazy lady that lives in the house. Wherever he is, I hope he is happy and finding lots of bugs to eat. Maybe now that I’m not staring at him, he will sing to me some night.